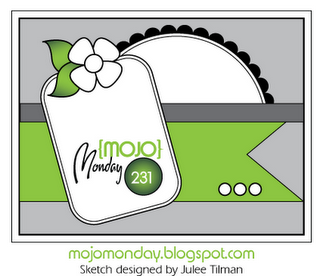 Stamping In Living Color: It's a "Mojo Monday" Sketch Challenge! It's a "Mojo Monday" Sketch Challenge! Hello, fellow stamping buddies! Today's card was inspired by the "Mojo Monday" Sketch Challenge that has become immensely popular. I love how each week's design incorporates a savvy technique and room for cute embellishments. To get my creative juices flowing, I began with an item that would serve as a focal point. In this case, I chose a tag from K & Company because I really liked its color palette. Next, I added textured card stock, stamped image, coordinating ribbon, and bling crystals to complete my card.